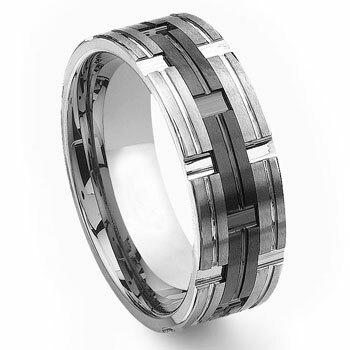 Another sharp looking high contrast tungsten carbide ring. The outside of the ring has three portions of the same design of longer sections with satin finish and a small section of high polish finish. The ring has a flat profile and a pipe cut design. It is a truly masculine ring design that will surely make you stand out from the crowd. The middle black ring is created with our 2nd generation black tungsten technology which the black color permanent. It is also manufactured with nickel binder and it is therefore 100% scratch proof and hypoallergenic. I got this ring for my husband as an anniversary gift. He loveddddd it. The design &color is so pretty. It took about two weeks to get here, (bcus I didn't pay extra for it to get here sooner.) The ONLY bad thing I can say about this ring, is that the edges are sharp &they scratch him. He says that it feels like it cuts him, but he still likes the ring lol. Other than that, we love it. We both really love the ring we got from Titanium Kays. The fit and finish are perfect! Thanks so much! WE LOVE this ring!! it is wonderful! I will most deff be comming back when we want anymor jewlry. we recived product quickly and check out was simple. thank you for your help. Ring fits perfect, service was awesome as usual, thanks for a great product at a reasonable price. First, I want to say this ring is very sharp. We bought it for my fiance's wedding band and when he tried it on it fit perfectly and looks great on his hand. It's very well constructed and is manly without being too overpowering for someone whose only jewelry is his watch. Secondly, I am highly impressed with Titanium Kay as a company. They had the ring shipped and delivered within 3 days of my order. We would definitely recommend this company.